Auto point Lpg Conversions operate a professional and cost effective installation service to enable Motor cars to run on LPG. All LPG installations are carried out in our modern workshop based in Corby- Northamptonshire. LPG Conversion is a growing industry with our company in Corby rapidly growing and playing an important part in it. 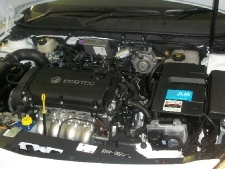 Running your engine on Autogas, is beneficial to your car. LPG is a cleaner burning fuel than petrol, so engine life is actually extended. Engine oil and spark plugs need changing less often when running on Autogas, so service intervals can be increased. Nearly all petrol vehicles can have a conversion to run LPG as well as petrol. Many major vehicle manufactures offer ‘factory fit’ LPG systems with their vehicles, to meet with increasing demand. Liquefied Petroleum Gasoline is a mix of Propane and Butane extracted from fields as a gas and a by product of oil production. LPG is recognized as a low carbon alternative to diesel and petrol. Under pressure LPG has the unique property of becoming a liquid so it can be stored. The ability to run on both petrol and gas. Safety - quality LPGA approved LP gas cars are recognised as being safer, offering better crash/fire tolerance.